The T025-Series Temperature Probe is a general purpose, lab/field temperature measuring probe offering affordable performance for many water applications. 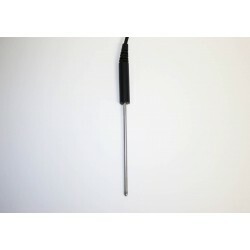 Features: Stainless steel probe with santoprene (rubber) handle/cap. 4mm diameter and 120mm length Many temperature sensor and cap color options available Fast response time Suitable for all general purpose applications ..